« San Francisco Bay Area Church of Craft in Oakland July 19! San Francisco CoC this Sunday! It’s a little last minute, but we decided to hold a CoC craft day in San Francisco *this* Sunday & I hope you can join us! Fellow crafter, Myla, has a great community room in her complex with tables, chairs & big windows that look out to the tree lined courtyard. Better yet, it’s conveniently located on Geary Ave, between Webster and Laguna St (across from Japantown). All CoC meetings are open house style: come and go as you like. 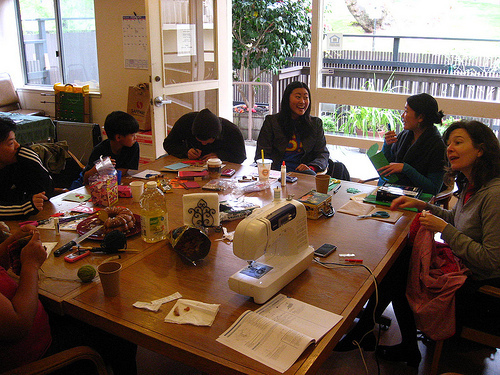 Bring your new or continuing craft projects to work on with your fellow crafters. Potluck snacks & beverages are welcome, but optional. Lottie Bennett Lane is an open sidewalk into the St. Francis Square apartment complex off the south side of Geary Blvd. between Webster St. and Laguna St across from Japantown. If you’re taking Muni, the 38 Geary stops at Webster st. and at Laguna St. DO NOT park in the apartment complex parking lots. There is no guest parking. That said, street parking is free and unrestricted on Sunday. We’ve had challenges finding a good space to regularly host San Francisco Church of Craft meet ups… do any of you have or know of a good space in the city? Preferably close to public transportation & it’s usually no more than ~8-15 ppl. This entry was written by Willo :: WilloToons.com, posted on July 22, 2009 at 1:08 pm, filed under Events, San Francisco/Oakland and tagged announcement, craft, meetings, San Francisco/Oakland. Bookmark the permalink. Follow any comments here with the RSS feed for this post. Post a comment or leave a trackback: Trackback URL.